1. RADIOLOGIC TECHNOLOGIST (RT): Also referred to as RT, Rad Tech, X-ray Tech, and Radiographer. Requires graduation from an accredited two year school of radiologic technology. 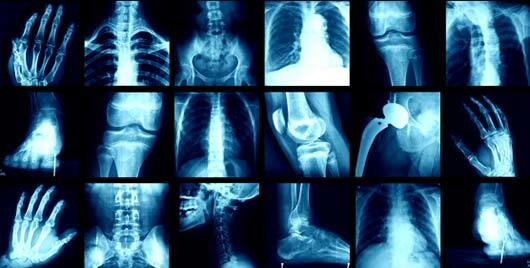 Performs general radiographic examinations on any and all body organs, systems, or structures. Individuals must show competency to meet all required state licensure or certification requirements or must maintain the credential R.T. (R) ARRT or equivalent (see definition of these initials at the bottom of this page). 3. REGISTERED RADIOLOGY ASSISTANT (R.R.A). An R.R.A. is an advanced-level radiologic technologist who enhances patient care by extending the capacity of the radiologist in the diagnostic imaging environment. Their role falls between the traditional roles of the radiologist and the radiographer. With patient safety as the number one concern, personal supervision is required for nine of the 26 radiologic examinations, including myelograms and some line or needle placements. Under these circumstances the radiologist must be in attendance in the room with the radiologist assistant during performance of the procedure. The remaining radiologic examinations - including procedures such as UGIs, barium enema studies, and arthrograms - require direct supervision. In these situations, the radiologist must be present in the office suite and immediately available to furnish assistance and direction throughout the performance of the procedure. The radiologist is not required to be present in the room where the procedure is performed. Other clinical activities, such as physical examination and obtaining informed consent - require general supervision, which means that they are monitored under the radiologist’s overall direction and control, but the radiologist’s presence is not required during performance of the activity. 4. LIMITED LICENSE or PERMIT: The permit holder is limited to performing only specific examinations of certain anatomical regions as determined by each state radilogy board. Individuals demonstrating competency receive limited licensure, permit, or certification. Limited practice may include combinations of the following: chest, abdomen, genitourinary, skull, pelvis, chiropractic, extremities, dental, orthopedic, fluoroscopy, and podiatry. Some states require attendance at a limited licensure school and passing the national or state limited permit examination; other states do not require formal schooling, but may require passing the state or national limited permit examination. Step One Limited license x-ray technologists are expected to have a high degree of technical and interpersonal skills. Because they work with patients who are ill or under stress, technologists should be emotionally stable, empathetic and patient. A limited scope license holder can not perform all radiology examinations, but rather can hold licenses to perform specific exams. In many states, an individual can become licensed in the following scopes of practice: chest, abdomen, genitourinary, skull/sinuses, chiropractic, extremities, fluoroscopy, and podiatry. Check with your state radiology board to see if your state acknowledges limited license for x-ray in your state. Currently 14 states have no regulations governing x-ray personnel; 28 states accept limited licensing or permits; 8 states do not recognize limited licensing. Each state has its own requirements so it is important that you contact your state radiology board. A link to our list of state radiology boards can be found at the bottom of this page. Some states require formal classroom training in a school specifically designed for limited license holders, while some states have no specific training requirements. Step Two Depending on what the requirements are for your state, get whatever training is required. Training will help you prepare to take the limited license exam that your state radiology board administers. Most states require that anyone who is given a limited license has to pass a limited license exam, so take your training seriously and study the course material thoroughly. 1) A comprehensive general exam with 100 questions covering all of the subjects you studied, including physics, radiation biology, radiation safety, technical factors, x-ray film processing, patient positioning, patient care, and others. 2) A scope of practice exam of 25 questions. This covers a specific scope of practice that you select. You determine what scope of practice you want to add to your license based on where you plan on working. For example if you will be working in an orthopedic office, you would have to have the extremities/orthopedic scope of practice. If you will be working in a chiropractors office, you would need the spine/chiropractic scope of practice. Although available scopes of vary by state, they generally include chest, abdomen, genitourinary, skull/sinuses, chiropractic, extremities, fluoroscopy, and podiatry. If you will be working in a facility where you will be performing a wide variety of exams, such as a family practice clinic, you may need to add additional scopes of practice to your license to cover all of the anatomy you might need to x-ray. You can add as many scopes of practice to your license as you want. You can always come back and add additional scopes of practice to your license later. For each scope of practice, there is an additional 25 question exam. Step Four Once you pass the limited license exam and the scope(s) of practice exams, the state will issue your limited licensure. You must only take x-rays of anatomy that is covered by your scope of practice. For example, if you work in an ENT office and you are licensed in Chest and head/sinuses, you cannot take x-rays of the spine, extremities, abdomen, etc. You can only take x-rays of the chest or sinuses. If you are found to be performing x-rays in areas in which you are not licensed, your limited license can be revoked and a fine can be assessed, not only to you, but also to the physician/clinic in which you work. If there are multiple violations, the doctor/clinic can lose its privilege of offering x-rays. It is very important that you only perform x-rays in areas in which you are licensed. If you find that there is a need to add additional scopes of practice to your license, you can always contact the state and schedule to take additional scope of practice exams. Step Five Continue your professional development by completing continuing education courses every year. In some states you are required to achieve a certain number of continuing education hours each year. In other states, continuing education hours are optional, but encouraged. You will be required to renew your license (for a fee) every year or every two years, depending on the requirements of the state. If you are a limited license/limited permit holder, you CAN take the same continuing education course more than once and receive credit. If you want to take one of our courses and you already completed it in the past, just e-mail us and we can re-set the course so you can purchase it again. If you are required to report your continuing hours to the ASRT or ARRT, you CAN NOT take the same course twice and receive credit.